Learn how to create and use enhanced custom fields in QuickBooks Online Advanced. Custom fields let you track the information that matters most to you and your customers. 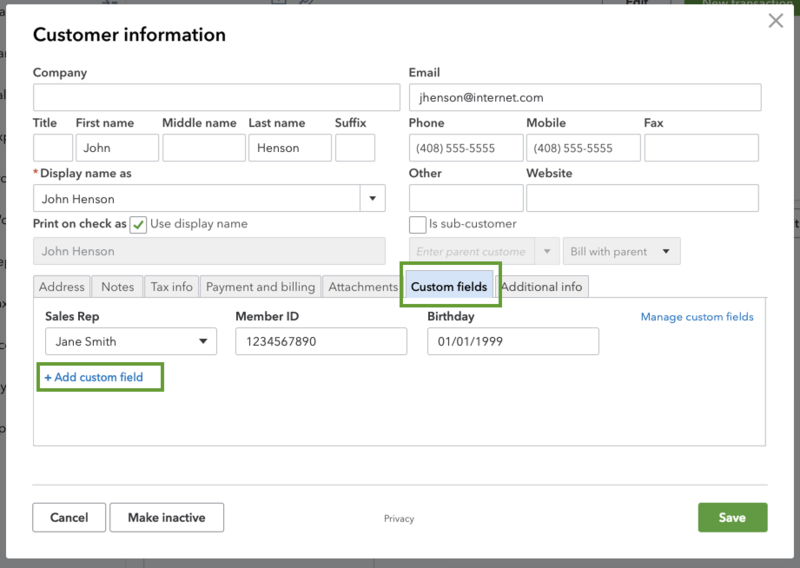 In QuickBooks Online Advanced, you can create custom fields (see this article for other QuickBooks versions) for almost anything: sales reps, birthdays, or information unique to your industry. You can add them to sales forms, purchase orders, and customer profiles. This gives you better data and more detailed financial reports. Enhanced custom fields aren't available for the QuickBooks Mobile App, yet. However, you can continue to use the old experience on mobile. You can have 10 active custom fields between your sales forms (invoices, expenses, estimates), purchase orders, and customer profiles. Besides text, you can also create custom drop-down, date, and number fields. Select the Gear icon from any page. In the Lists column, select Custom fields. Select the Create custom field. If you’ve already created a field, you’ll see the Add field option instead. Choose Customer info or Transaction info. Customer info fields are for customer profiles. Transaction info fields are for sales forms and purchase orders. Give your custom field a name. Select Text, Number, Date, or Drop-down list from the Type drop-down. Choose where you want your custom field to appear. To show on sales forms and purchase orders only you see, choose Show on sales forms. To show on forms your customers see, choose Show to customer. Select Save when you’re finished. Get ideas for custom fields you can create. You can edit your custom fields on the Custom fields page. To change a custom field’s name, type, or visibility to customers and vendors, select Edit in the Actions column. Any edits you make here apply to all sales forms, purchase orders, and customer profiles using the field. Select the arrow in the Actions column (next to Edit). Select Make active (or Make inactive). If you make a custom field inactive, your past data won’t disappear. You’ll still see the field on sales forms and purchase orders you used it on, but it won’t appear on new forms. You can also edit your custom fields from sales forms, purchase orders, and customer profiles. 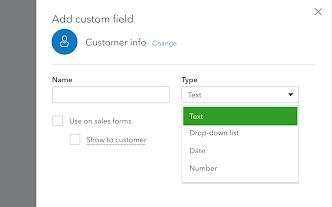 Open an existing sales form, or select Create (+) to create a new one. Select the Gear icon at the top of the form (not the Gear menu on the main navigation bar). In the Custom Fields section, select + Add custom field to add a new field. Select the pencil icon next to a field name to bring up the Custom fields page to make edits. Important: Keep in mind, any changes you make on forms affect all forms and customer profiles using the custom field, not just this form. Select the Gear icon again to close the window. Open the Sales menu from the navigation bar. Find and open a customer profile. Go to the Custom fields tab. Select + Add custom field to add a new field.